How can you imagine forever with someone who's leaving everything behind? Trinity has always been the cute, and funny one, who most guys overlook in pursuit of her "hot" friends. She became used to being everyone’s pal, until the day the young man she was attracted to, was drawn to her in return. He became her first great love, and first crushing heartbreak when she found him in bed with one of her closest friends. Callahan doesn’t want to get close to anyone—let alone Trinity. He finds her perkiness insufferable and her attempts to entice a smile distracting. After all, he’s in Kiawah to leave all feelings behind. But when it comes to Trinity, who feels everything, it's hard not to feel something. I just loved this book. I am really new to Cecy Robson's writing, having only listened to one other audiobook before starting this one. I loved the first book that I read from this author so I was really excited to get started with this one and I must say that it lived up to every one of my expectations. It was a really great story and the audiobook production took everything to the next level. I knew from the very start that this was going to be a different kind of romance. The book opens with Callahan in the middle of a mission which was a bit of a surprise. It was a really quick scene but it gave me a whole lot of insight regarding the things that he had seen and the things that he had done. Trinity is spending one last summer working with her friends after college before heading off with the Peace Corps. Callahan is working as a bartender where her Trinity likes to hang out with her friends and there is no going back after their paths cross. I loved Callahan from the very start. I must say that he was a bit of a grump at the start of the book but that just made me like him more. What can I say? I just love a grumpy Hero. Trinity was really perky and at the start of the book, I thought that she might be just a little bit too much but she quickly grew on me. I thought that both characters had a lot of depth and had been through a lot. I felt like these two belonged together. They had great chemistry and seemed to be exactly what the other needed. 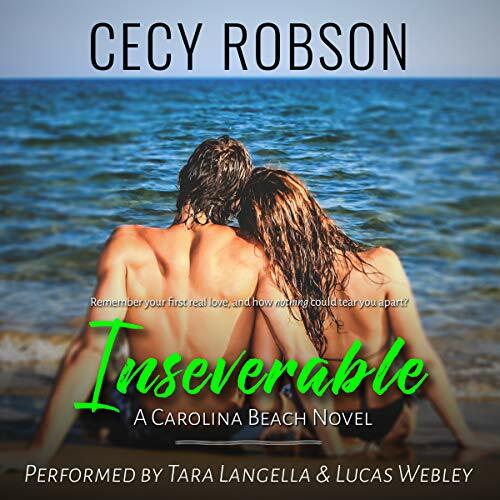 I thought that Tara Langella and Lucas Webley did a phenomenal job with this audiobook. They put a whole lot into their performance and I enjoyed the fact that the audiobook was more dramatized than the average book. Tara Langella performed all of the female voices even when the chapter was being read from the males point of view and vice versa. I have only listened to a couple of audiobooks that use that format but I think that it is quite effective and helps the dialogue feel much more natural. There were also a few well-done sound effects added to the book. I thought that both narrators had voices that were easy to listen to for hours at a time. I would recommend this audiobook to fans of contemporary romance. It was a great romance featuring two characters that I couldn't wait to see reach their happily ever after. The audiobook was a fantastic experience and I do recommend trying to listen to this one if you get the chance. I can't wait to read more from Cecy Robson. I received a review copy of this audiobook from the author via Caffeinated Services. I have really enjoyed the two that I have read. I thought that this one was really well-done. It was like getting a flashback to start things off. I thought it was a great start. I don't read a lot of contemporary books, but a good book is a good book, no matter the genre. And I do like grumps too. Grumps are so much fun! That is neat how they did the audio voices. I've never listened to one like that. I have only run across one other book that used the male and female narrators like this one but I loved that book as well. It is nice to have consistent character voices. This is only the second book by Cecy Robson that I have read but I loved it and the narrators did a great job with it. So glad you loved this Carole! This is only the second book of hers that I have read so I haven't had the chance to try her UF series but I do hope to soon. This sounds like a wonderful romance! I read one of this author's paranormal books and it did't knock my socks off, but I'd be willing to give her another try. I also love it when the female narrator does her bits no matter if it's the male's chapters and vice versa. Very few books do that and I don't know why they don't all do that. Why have a male and female narrator if they're not going to do all their parts throughout? I just love this style of narration but you don't come across it often. I do think that this one is worth trying out if you get the chance.